Growing up in Cincinnati, Jennie C. Jones hated playing the piano so much she hid under her family’s dining room table to avoid practice. Jones, who has a good ear, could play back anything her piano teacher demonstrated but often was scolded because she wouldn’t read music. Eventually she quit. She took up violin and quit that, too. But the sound that filled her family’s home was unavoidable. Jones’ mother had a great record collection that engendered a deep respect for black music history. After the visual complexity of such recent exhibitions as “Texas Design Now” and “Marilyn Minter: Pretty/Dirty,” the museum looks so radically spare that a visitor might wonder where all the art went. 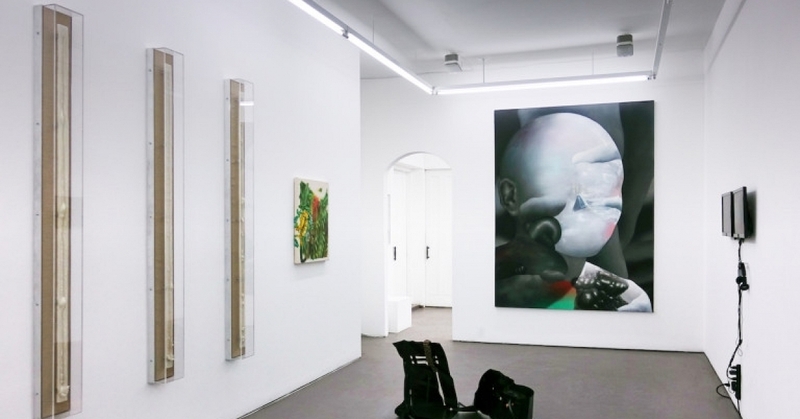 The Brown Foundation Gallery, a sprawling 8,000 square-foot space, contains 22 blank-looking, monochromatic paintings; several series of small works on paper; and a smattering of simple sculptures. An ambient sound piece permeates the space, and around a wall to the left, other sonic works loop in a listening room with dark walls and a long bench. It’s a little bit Barnett Newman meets Charlie Parker - not that you need to know modern art or jazz history to appreciate Jones’ work. “I hope it’s an elegant, peaceful experience for people,” Jones said, the day before the show opened. Jones now calls listening a “conceptual practice,” but didn’t realize it was her forte until after she’d gone through the rigors of art school to become a painter. 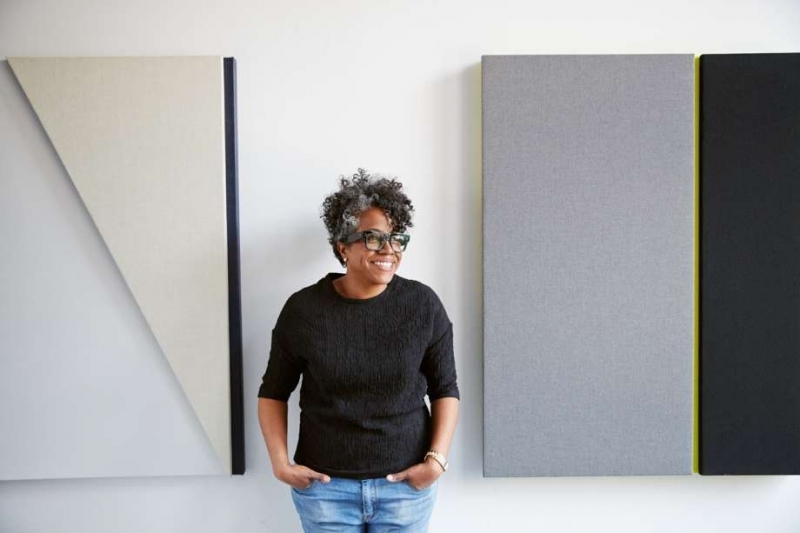 During her early 30s, after she’d earned degrees from the Art Institute of Chicago and Rutgers University’s Mason Gross School of the Arts, Jones was stumped about what to create. 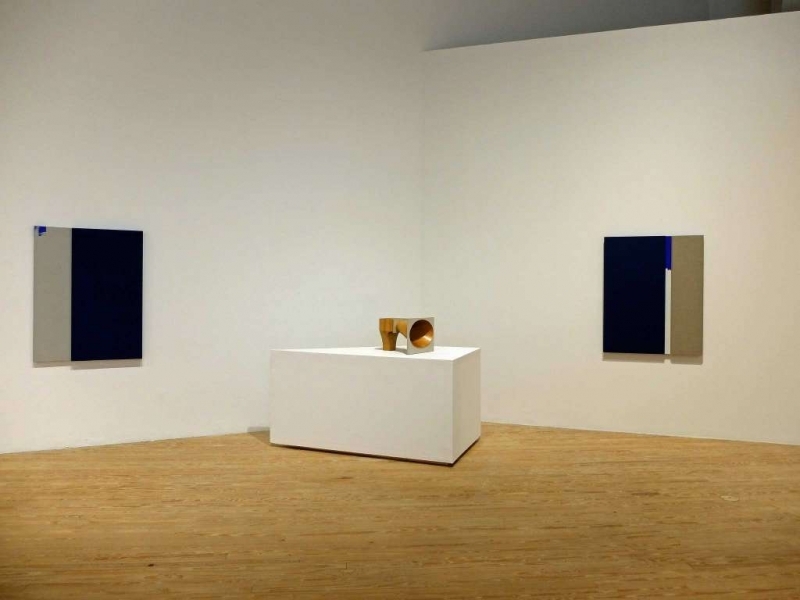 She wanted to riff on the minimalist aesthetics of mid-20th century giants such as Newman and Ellsworth Kelly, but felt out of place as part of a generation heavy on busy, sociopolitical art. Then one day, Jones realized how much time she was spending curating the music she wanted to hear while she worked. Listening, she suddenly understood, pulled all of her worlds together. The giants of abstract art, who tended to be white men, listened while they painted to the modern, experimental jazz of blacks. Adding another layer to it as a black woman a half-century later, Jones also recognized that the emptiness of minimalist art, which reduces painting to nearly blank canvases, could also be a metaphor for the competing forces of absence and presence, exclusion and inclusion, silence and noise. Her epiphany also had a practical aspect. Living in Brooklyn, Jones couldn’t afford a studio. 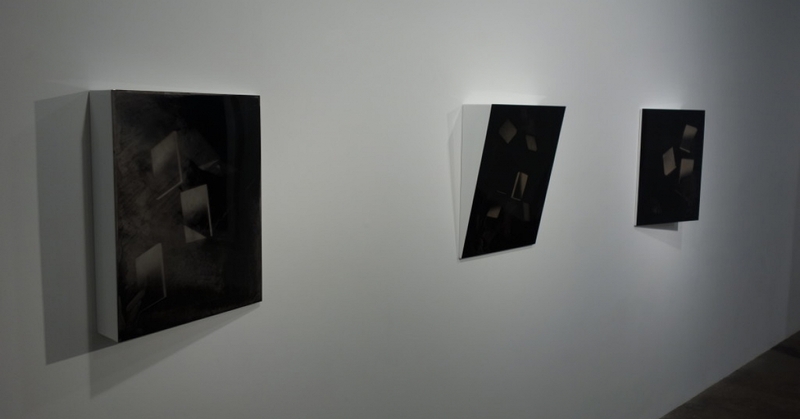 She’d been making small works on paper and “drawing” site-specific pieces with gaffer tape on gallery walls. But by manipulating and layering bits of old recordings - creating what she calls digital audio collage - she could fill a space without taking up much space at all, save for speakers. She might stretch out Miles Davis’ “In a Silent Way,” say, within the three-movement formula for John Cage’s famous “silent” composition, 4’33,” which forbids performers to play their instruments, forcing their audience to hear a room’s ambient sounds. Jones also found source material for her visual art in the “physical detritus” of listening to music - from speakers to record album packaging. You can’t look at or listen to any of it without thinking about what isn’t there. Curator Valerie Cassel Oliver compares Jones to the protagonist of Ralph Ellison’s 1952 novel “Invisible Man” in the show’s catalog. References to Newman’s famous “zips,” thin bands of a contrasting color that divide the surface of a painting, are evident in the “acoustic paintings” Jones has been making since 2011. The dominant chords of the show utilize acoustic absorber panels - the fabric-covered rectangles used in recording studios to reduce ambient noise - as elements of painted canvases. They’re “active,” Jones said. The closer you get to them, the quieter it is. They are visually silent as well, with large fields of dull gray, black or white interrupted by strips of psychedelic red or chartreuse. Often, the bright, contrasting color appears on the edges of the canvas, where reflections vibrate on the gallery’s white walls. “I struggle with color. I like to separate it,” Jones said. Her most recent paintings, created for the CAMH show, are a rich, Yves Klein-like blue. Jones sees them as a “bookend” for the survey. Their titles are based on a text piece she did in 2003, when she pored over the index of the book “Reading Lyrics” and marked all the titles that had the word “blue.” But these new works have looser, more distressed elements than her meticulous canvases of a few years ago. The show’s earliest works are discrete drawings and collages from 2004 inspired by audio equipment. They feature abstract, irregular rectangles dangling from quivery, thin lines. There’s something engagingly human and imperfect in those lines, which look simultaneously funny and sad. 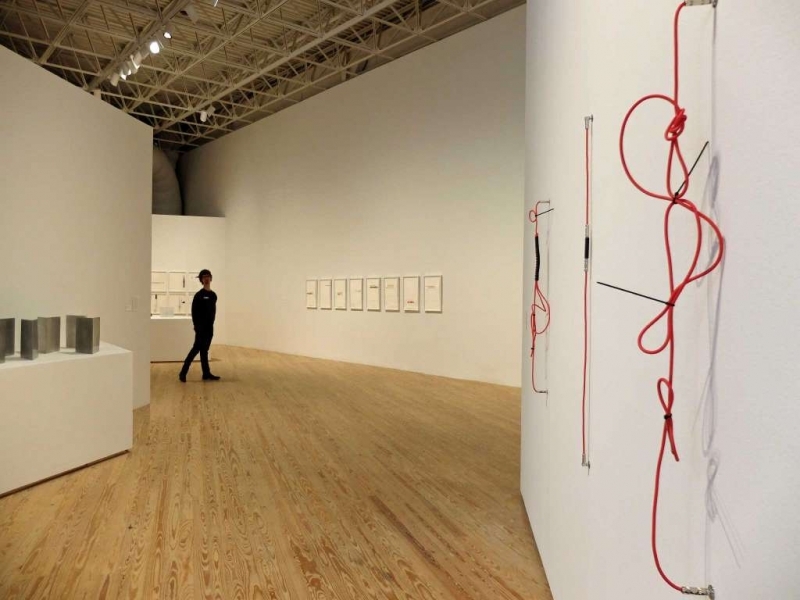 When the CAMH survey show came together, Jones was surprised to see how those early drawings evolved over a decade into three-dimensional pieces, such as the works of her “SHHH” series, which are made from noise-cancelling electric guitar cables that she “plugs” directly into walls. Jones still doesn’t read music, but she loves the visual language involved in music-making. A grid of works from her 100-piece drawing suite, “Score for Sustained Blackness,” fills a back wall with the show’s most dramatic works on paper. Sometimes her titles are grander than her work, she said, chuckling, but she wanted to “push through the tenacity and the contributions, struggles, ups and downs and lows, all of that coming through in these gestures of line that also mimic sound waves in bursts and quiet.” And that demanded 100 drawings. “I was a little ambitious last year,” she said. Two graphic scores in the show pay homage to favorite personalities. “Gray Score (for Agnes),” from 2012, was inspired by the gray palette and paintings of the abstract expressionist Agnes Martin. “I spent a lot of time thinking about gray, not as a noncolor but as hush, as mute, as quiet. And the color gray’s relationship to sound and sound work,” Jones said. Jones repurposes antiquated audio equipment to create her sculptures. 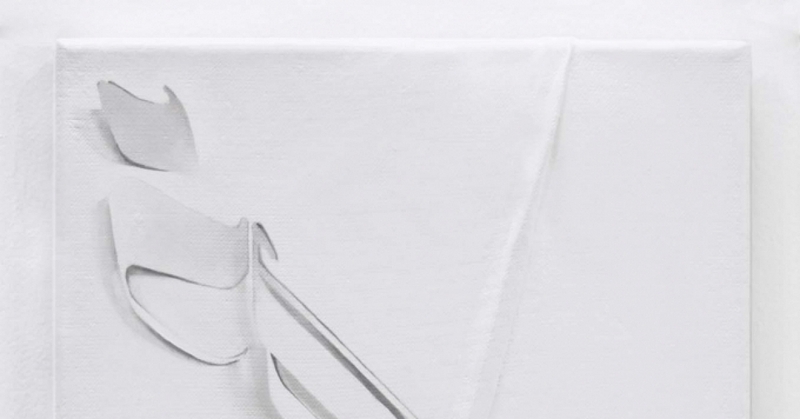 Several of these works echo iconic sculptures by Marcel Duchamp and Louise Nevelson. Others simply appeal for their shapes, including “Bass Traps With False Tones #1 and #2,” which occupies a prominent pedestal. 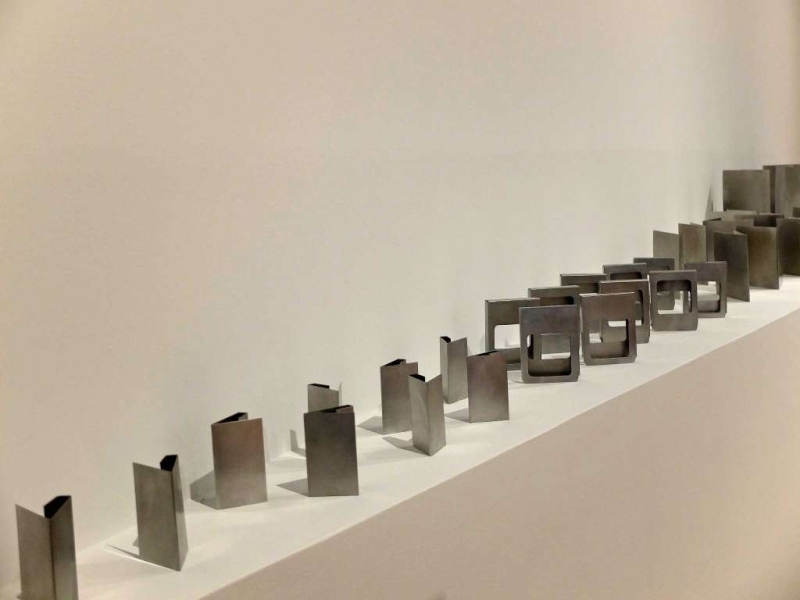 The exception, made with a craftsman in California, is the 40-piece “Song Containers,” a collection of aluminum sculptures that memorialize outdated audio-cassette boxes, 8-track sleeves and record covers. Jones is acutely aware of how listening has changed over time. “Variant Static,” the work that provides ambient sound for much of the show, nods to old-style listening. It’s not melodic in any traditional sense but richer than the title suggests, brimming with anticipatory moments sliced from the beginning and closing chords of songs. Jones’ source was a collection of music she bought from a woman who was selling her late father’s collection. The man had compiled favorites from his 78 rpms onto CDs. “So I started with that,” she said. Jones doesn’t consider herself a composer in the formal sense, and she never performs her sonic works like a DJ might. “I’ve been asked before to show up with a laptop, but I’m not that person. I’m into headphones and doing my own thing that will live in the space without me present, like a painting,” Jones said. Yes, that’s a lot of time to sit still these days. That’s the point.